Last well I scratched my head when NBC Sports announced that former Redskins coach Joe Gibbs and former Redskins quarterback Joe Theismann would join Tom Hammond in the booth for the Jets-Bengals game. At the time of the announcement I wrote that "this three man in the booth combination is either brilliantly conceived or some kid of bad practical joke." It turns out to be somewhere in bbetween as confirmed by Richard Sandomir of the New York Times (thanks to David Hale of the Macon Telegraph for the link). 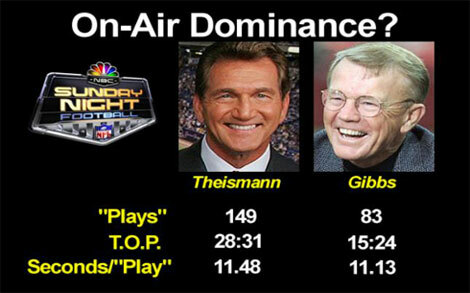 In his Sunday, January 10, 2010 column, Sandomir noted that what it came to "air time posession, Theismann dominated Gibbs, saying that "Theismann spoke 149 times during the game, taking up 28 minutes 31 seconds of airtime. Gibbs’s 83 moments of airtime added up to 15:24" (I wonder who Sandomir hired to keep that specialty stat?). The problem is that Theismann is an in your face Type A, never afraid to express and opinion. Gibbs is the nice guy gentleman that, as Sandomir said, "was too deferential to pounce on every sliver of verbal daylight." Of course once Gibbs starts talking, his pace is slower and not a quick hit like Theismann. Even so, he was quite close to Theismann in seconds per possession, with his 11.13 seconds per possession just behind Theismann's 11.48 seconds. Although Sandomir does not go into any explanation why two producers, Tommy Roy and Rob Hyland, or why NBC Sports had to "borrow" FOX Sports director Artie Kempner, his critique is definitely worth a read. And if you want a snarkier critique, Bob Raissman of the N.Y. Daily News offers his take this morning.